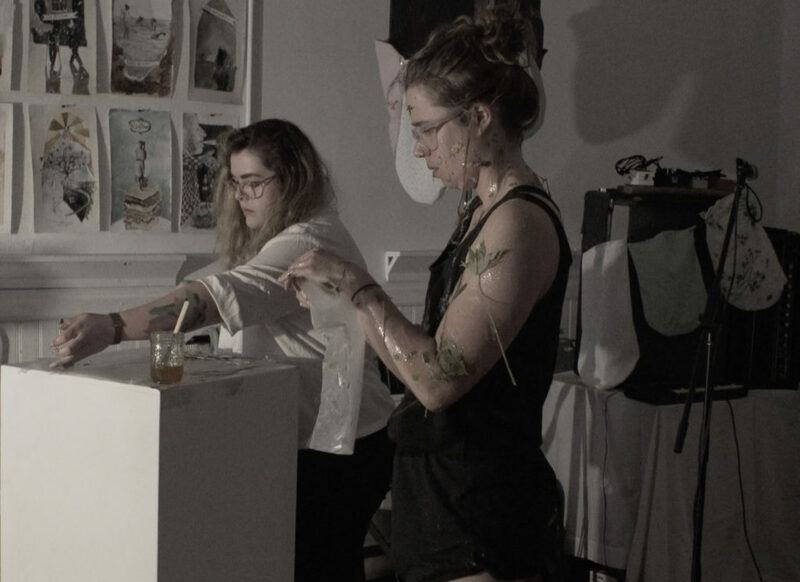 rudi aker and sophia bartholomew are Connexion ARC’s current artists-in-residence, learn more about their project, Soft Mask, and Limited Time Offer, a pop-up exhibition and residency program hosted by Connexion. Limited Time Offer works outside of traditional exhibition strategies by activating Connexion’s current shared workspace into a temporary gallery. Projects will be installed for 72 hours only, showcasing artistic production completed by artists-in-residence over the months of July and August, on view from August 25 – 27. Kasie Wilcox: Can you describe how this collaboration started? rudi aker: We’d reconnected just as sophia was preparing a performance art piece for Flourish Festival, and wound up collaborating in making that performance, which was so much about emotional labour, or like formulations of protection and care… creating intimacy… yeah, a lot of the same things we’re working on with this project. KW: Tell us about the project you’re developing during your residency with Connexion. Bread & Roses. Photo by Chris Giles. sb: Yeah, making this work still feels very physical, and like embodied, but it also feels more playful. For me there’s definitely a greater sense of safety, working with objects. Like there’s more of a buffer, we’re not negotiating so immediately and so intensely with the people who ultimately receive this work. KW: Conversation and exchange appear to be a crucial aspect of this project, can you speak to that? sb: Yeah, we’ve also been considering and kind of responding to the specific space where the work will be shown — that feels like a kind of conversation as well. Like using sculptural elements to alter the codes and signals that already exist in that space. KW: You will be engaging the public in a workshop to discuss the themes of your project, can you describe what this will look like? sb: Sure, in this workshop we’ll be working with participants to examine the ways we understand love and care. I think we’ll start by presenting some ideas we’ve each been researching, and talking about together — with a focus on safer space making, care-giving practices, trauma-awareness and healing. KW: You both work as multi-disciplinary artists, and this is true for many contemporary artists. What led you to broadening the boundaries of your practices? ra: I think that for awhile I’ve been trying to find that juncture between traditional craft — like beadwork, or like knitting — and art, particularly painting. I’ve been trying to figure out how to incorporate all of these things into my practice, because they are all important parts of who I am, and my practice is so much an extension of myself. There was a period of time when I was trying to focus only on painting, and I started to feel really trapped… As a person who is intensely interested in so many things, all of the time, I’m more invested in exploring the broad possibility of art. Like how it’s not about what you use materially, it’s about how you use it. I mean, what’s “art” anyway? Who cares about art? I like to do stuff because it’s nice. I like to keep my hands busy and my head busy. sb: Yeah I can definitely relate to this. When I showed up at art school in my early twenties, I thought I was going to become an Impressionist painter. Like everything I had learned about “art” up until that point had led me to believe that that was what art was, but… besides having done a lot of drawing and painting growing up, I had also been writing, and making books, doing ceramics, learning about dance and theatre performance. When I started studying contemporary art at UBC, I fought it, like I hated it, but gradually I began to understand that these other modes of expression were as much part of my art practice as the two dimensional work I had been doing. I really connected with work made by artists who were concerned with artist-run space-making and networked exchange — whose practices were oriented towards physical performance, social interaction, and material experimentation. 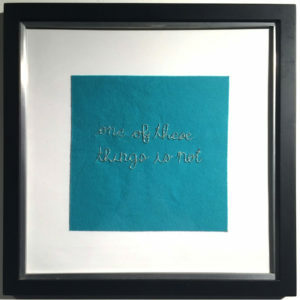 KW: I’ve noticed that you both incorporate text in your work, when did you individually start to engage language as a part of your artistic practice? 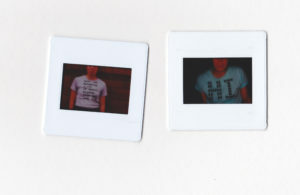 sb: Well, when I moved to New Brunswick five years ago, I was in the middle of working on a performance called make yourself a version of your self, which involved making and wearing a different text-based t-shirt every day for more than a year. I guess that this project was experimenting with the surface or veneer of self-presentation created by both language and clothing, but then the t-shirts also fostered a lot of conversation with friends and with strangers… forcing me to grapple with philosophy, art theory and political ideas in my day-to-day life. When I look around me, when I listen, I recognize all these different structures that have been made and upheld by language… and I guess for me, language has always felt very material… almost sculptural. Language is just so instrumental in constructing the world we live within, and the things we understand to be true. ra: I think for me it was…I don’t know, I was doing lot of reading, and writing a lot of poetry — like bad poetry — and out of that, I started to keep a list of all of these things that I thought or said or heard… things that really meant something, or struck a chord somehow. Like I’ve always maintained both a painting and a writing practice, it was just a matter of figuring out how to incorporate those two things together. Like, I really like the absurdity of words, playing with emotional responses to words and phrases… and I find that the words that I use are almost like punch-lines. My work always has to do with emotional intensity, my lived experience of that, and language sometimes feels like the most direct or potent route to take. KW: I was looking at your artist websites today, and something on your website, sophia, struck me. It’s a phrase on the homepage that says “as soon as i say something it stops being true.” Can you elaborate on this? ra: (laughs) I don’t know, I totally disagree with that statement. Like, I think that of all the many thoughts and feelings that pass through me, continuously, if I’m prompted to say any of them out loud they become true. If you say it, it is a truth. ra: Yeah, I understand what you mean though… there’s a fluidity of truth, I feel. Limited Time Offer opens on Friday, August 25. Joins artists and organizers for an opening reception at Sixty-Five York Creative Studio (65 York Street) from 7:00 p.m. – 9:00 p.m. Visit Connexion ARC on Facebook for full details. A workshop facilitated by rudi and sophia will be held on Saturday, August 26, from 6:00 p.m. — 8:00 p.m., at Sixty-Five York Creative Studio (65 York Street), where they will work with participants to foster self-reflection and development of ideas — discussing inclusivity, safety, mutual support and care for our selves and our communities. This project is presented with the support of Sixty-Five York Creative Studio and shiftwork collective.